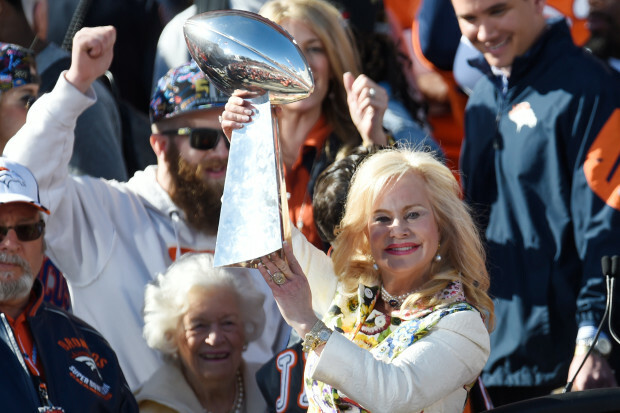 Broncos owner Pat Bowlen's wife, Annabel Bowlen, hoists the Lombardi Trophy during the Denver Broncos Super Bowl championship celebration and parade on Tuesday February 9, 2016. Denver Broncos‘ owner Pat Bowlen‘s wife Annabel has announced that she, too, has been diagnosed with Alzheimer’s disease. In 2014, Pat Bowlen revealed that he is dealing with Alzheimer’s disease at the same time that he relinquished control of the team. “Since Pat’s diagnosis, I have gained a vivid understanding of this disease’s progression and its effect on those living with it as well as their families. My family and I have been — and will remain — dedicated supporters of Alzheimer’s awareness, treatment and research funding,” Annabel Bowlen said in a public statement. In her statement she said she decided to make her diagnosis public right away in the hope that it continues to raise awareness for those battling Alzheimer’s and their loved ones. “With June also being Alzheimer’s & Brain Awareness Month, the timing was right for me to share this personal update with everyone,” Annabel Bowlen said.